These artworks were modeled after an ancient prototype. The four limestone statues figure approximately 24" high on the path west of the Visitors' Center in Allerton Park. Robert Allerton gifted these sculptures in 1946. 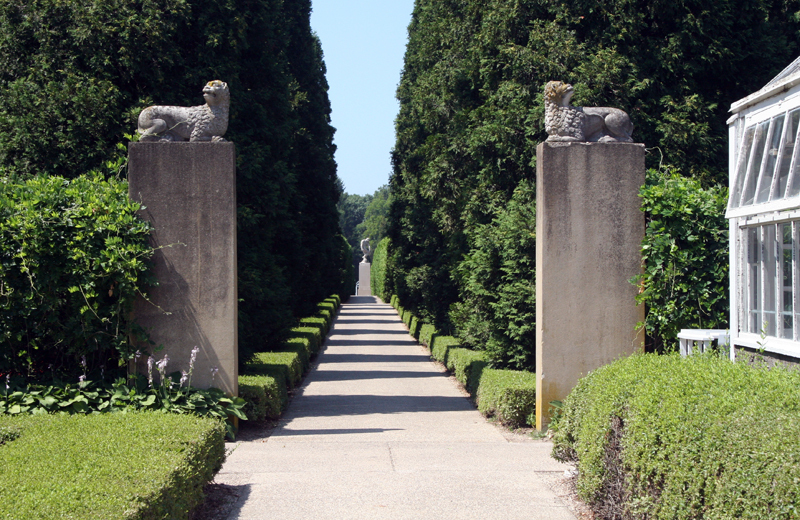 Two pairs of stone lions look down from pillars at either end of a long gravel pathway near the greenhouse, one pair made before 1922 in Chicago from originals Allerton owned, the other in Indiana in 1976. John Allerton's recollection was that the prototype may have been Assyrian, but, he said, "I don't know how they were acquired. I think they must have been up against a building, a doorway, or at the base of a doorway." Symmetrically arranged, the statues effectively demarcate a long expanse of formal garden walkway. They appear to be carved in the round. A closer inspection shows them to be very high reliefs with flattened backs, apparently once used (in their predecessor's ancient settings) as architectural decorations. 515 Old Timber Rd, Monticello, IL 61856 ~ These paths can be found on the path west of the Visitors' Center in Allerton Park. Muriel Scheinman, “Lions, before 1922, and 1976,” ExploreCU, accessed April 19, 2019, https://explorecu.org/items/show/47.